The biggest risk that Middle East Respiratory Syndrome (MERS) will become a global epidemic, ironically, may lie with globe-trotting health care workers. “This is how MERS might spread around the world,” said infectious disease expert Dr. Amesh Adalja of the University of Pittsburgh Medical Center. Health care workers “are at extremely high risk of contracting MERS compared to the general public,” Adalja said. The threat has attracted new attention with the confirmation of the first two MERS cases in the United States. Both are health care workers who fell ill shortly after leaving their work in Saudi hospitals and boarding planes bound west. About one-third of the MERS cases treated in hospitals in Jeddah were health care workers, according to the World Health Organization (WHO). The Ministry of Health’s counted 529 MERS infections since September 2012, of which 168 patients died as of May 17, 2014. Despite the risk, few of the health care workers now in, or planning to go to, Saudi Arabia are having second thoughts about working there, according to nurses, doctors and recruiters interviewed by Reuters. Michelle Tatro, 28, leaves next week for the kingdom, where she will work as an open-heart-surgery nurse. Tatro, who typically does 13-week stints at hospitals around the United States, said her family had sent her articles about MERS, but she wasn’t worried. Neither the Centers for Disease Control and Prevention nor the Department of Homeland Security responded to questions about whether they were considering monitoring health care workers returning to the United States. The Saudi government is building hundreds of hospitals and offering private companies interest-free loans to help build new facilities. The majority of US-trained medical staff are on one- or two-year contracts, which results in significant churn as workers rotate in and out of Saudi medical facilities. Arabie’s firm is trying to fill positions at two dozen medical facilities in Saudi Arabia for pulmonologists, a director of nursing, a chief of physiotherapy and scores more. Nurses’ pay depends on their home country, with those from the United States and Canada earning around $60,000 a year while those from the Philippines get about $12,000, recruiters said. That typically comes with free transportation home, housing, and 10 weeks of paid vacation each year. For Americans, any income under about $100,000 earned abroad is tax-free, adding to the appeal of a Saudi posting. One Filipino nurse, who spoke anonymously so as not to hurt her job prospects, told Reuters that she was “willing to go to Saudi Arabia because I don’t get enough pay here.” In a private hospital in Manila, she made 800 pesos (about $18) a day. None of Arabie’s potential candidates “have expressed any concern” about MERS. Only one of the hundreds of professionals placed by Toronto-based medical staffing firm Helen Ziegler & Associates Inc. decided to return to the United States because of MERS, it said, and one decided not to accept a job in Jeddah she had been hired for. Recruitment agencies in Manila have also continued to send nurses to the kingdom since the MERS outbreak, said Hans Leo Cacdac, the head of the Philippine Overseas Employment Administration. The government advises that returning workers be screened for MERS, Labor and Employment Secretary Rosalinda Baldoz said this week. 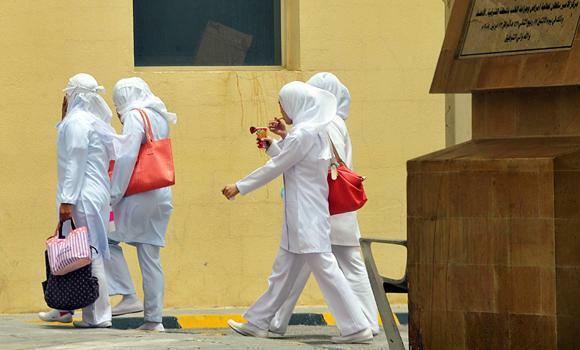 Expat health care workers now working in Saudi Arabia feel confident local authorities are taking the necessary steps to combat the spread of MERS in hospitals. “Just today they came and put up giant posters in our hospital on MERS,” said Dr. Taher Kagalwala, a pediatrician originally from Mumbai who works at Al Moweh General Hospital in a town about 120 miles from Taif city in western Saudi Arabia.